Gurgaon-based matchmaking app for differently abled Inclov has raised Rs 1 crore (around $149,000) in a seed round of funding from Sarbvir Singh, former MD of Capital 18, and media entrepreneur Raghav Bahl-led digital news venture Quintillion Media Pvt. Ltd, a person privy to the development told Techcircle.in. "Rohan Gogari, director of Kesar Group; Apparswamy Subramanian, corporate banking head, RBL Bank; Praveen Visesh, director at Deutsche Bank and Narayanan Venkatraman, former MD at Mount Kellett, an investment firm, also participated in the round," said the person cited above on the condition of anonymity. Intellecap Impact Investment Network too participated, according to VCCEdge, the data research platform of VCCircle. 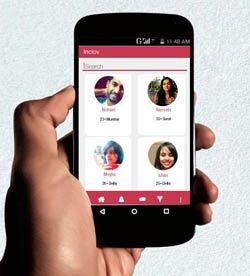 The startup aims to use the funds for redesigning the Android app and will be also launching the iOS version soon. It aims to go global with the app. Inclov Technologies Pvt. Ltd, which runs Inclov, was founded in 2014 by Kalyani Khona as a matchmaking agency for the disabled people under the banner Wanted Umbrella and later launched Inclov in January. Shankar Srinivasan joined the firm as a co-founder in 2015. Kalyani is a graduate of HR College of Commerce, Mumbai, and a recipient of the Rajeev Circle Fellowship, a fellowship launched by Silicon Valley venture capitalist Asha Jadeja Motwani to enable Indian entrepreneurs to connect with mentors and seed investors in Silicon Valley in the US. Srinivasan is a graduate of Jai Hind College, Mumbai, and has previously worked with publishing firm Pearson India. Last August, the startup had raised about Rs 6.5 lakh on Wishberry, a crowdfunding platform and the money was used to build the prototype of the app and was even tested with 50 people to ensure ease of operation by the differently abled. The app has to date registered 1,300 matches. More than 4,000 profiles of differently abled are listed on the app. Separate e-mail queries sent to Inclov, Quintillion Media, Singh, Gogari, Venkatraman, Subramanian, Visesh and Intellecap, did not elicit any response at the time of filing this report. Angel investor Ajeet Khurana, who also supported Inclov on the crowdfunding platform Wishberry, is however a bit apprehensive about the firm's revenue model. "They are solving a real need. I was surprised to see that nobody has ventured into this space so far and even encouraged more people to put in money in the platform. But as far as its business prospects are concerned, it is hard to say at this time that an adequate opportunity is available," he said. The dating and matchmaking apps industry in India has been gaining momentum with a number of players entering the market and raising funds. In April, Dil Mil, a matchmaking app for South Asian expatriates, had raised $2.7 million (around Rs 18 crore) in pre-Series A funding from Nelstone Ventures, Transmedia Capital, Maiden Lane Ventures, CSC Upshot and a bunch of angel investors. In January, Bangalore-based matchmaking app Aisle raised Rs 1.25 crore ($183,000) in its pre-Series A round from TermSheet and ah! Ventures.